VANCOUVER, British Columbia, Oct. 24, 2018 (GLOBE NEWSWIRE) -- Triumph Gold Corp., (TSX-V: TIG) (OTCMKTS: TIGCF) (“Triumph Gold” or the “Company”) is pleased to announce the results of exploration drilling in the Granger and Guder zones on its 100% owned, road accessible, Freegold Mountain Property in the Yukon Territory. 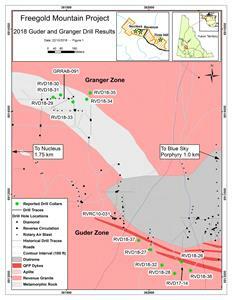 The Granger and Guder zones (Figure 1) are located in the central portion of a six kilometre long multi-element soil anomaly that also contains the recently discovered high-grade, gold-rich Blue Sky Porphyry over one kilometre to the east and the Nucleus gold deposit over 1.5 kilometres to the west. Six holes totalling 1,014 metres tested a shallow oxide gold target in the Granger Zone, which is located between the Revenue diatreme and Nucleus gold deposit. Historical exploration in this zone included trenching, rock sampling, with grab samples up to 45.5 g/t (grams per tonne) gold (Au), and percussion, RC (reverse circulation) and limited diamond drilling. Historical drilling intersected multiple shallow oxide gold intercepts, including 5.29 g/t Au over 13.71 metres in GRRAB-091 (from 3.05 metres to the bottom of the hole at 16.76 metres). Drilling in 2018 intersected variably oxidized mineralization in every hole, delineating a mineralized corridor over 200 metres strike-length and to a depth of at least 74 metres. The mineralized zone is open in all directions and to depth. The geological setting and the style of mineralization in the Granger Zone are similar to the Nucleus gold deposit, located approximately 1.5 kilometres to the west. Mineralization is focused within a brecciated and highly altered roof pendant of metamorphic rock surrounded by the Revenue Granite and intruded by numerous quartz-feldspar porphyry and microgranite dykes. Six drill holes totalling 1,352 metres tested the Guder Zone, located approximately one kilometre southeast of the Granger Zone on the south side of the Revenue diatreme. These drill holes followed up on a high-grade gold intersection in RVD17-14 (15.0 g/t Au over seven metres; PR#17-14 dated November 15, 2017), and on porphyry style alteration and veining encountered in the same hole. The 2018 drilling intersected significant copper and gold grades in supergene enriched sulfide (e.g. RVD18-27 with 37.50 metres of 0.26 g/t Au, 3.3 g/t Ag and 0.17% Cu) and hypogene sulfide porphyry style mineralization (e.g. RVD18-37 with 26.38 metres of 0.26 g/t Au, 0.11% Cu). The best porphyry style veining, alteration and mineralization was intersected in the two drill holes collared farthest to the west (RVD18-27 and RVD18-37). This mineralization may be part of a larger mineralized zone also intersected by several historical drill holes approximately 200 metres to the west including RVRC10-031 which collared in 13.71 metres grading 0.49 g/t Au, 6.5 g/t Au, 0.310% Cu (6.10 – 19.81m) and bottomed in 44.20 metres grading 0.51 g/t Au, 3.5 g/t Ag, 0.175% Cu (73.15 – 117.35m).